It was a magical evening of a visual, sound and flavor festival, which combined traditional Islamic arts, music and cuisine. Under the patronage of Princess Adela bint Abdullah bin Abdulaziz Al-Saud, the spouse of the Secretary General of the Organization of the Islamic Conference (OIC), Mrs. Fusun Ihsanoglu, hosted a cultural event from Feb. 27 to March 7 at her residence in Jeddah, which was attended by princesses, spouses of members of the diplomatic corps, artists and distinguished guests. The event coincided with celebrations of the return of Custodian of the Two Holy Mosques King Abdullah in good health and featured an exhibition of calligraphy, gilding and marbling (Ebru), which was provided by the Istanbul-based Research Center for Islamic History, Art and Culture (IRCICA). Ebru, or cloud-like or water surface, is an ancient Turkish art that originated in Central Asia. Using special pigments and thickeners, applying them on water with certain brushes and shaping the drops and lines with delicate skill, results in beautiful colored patterns and abstracts created on the surface of the water. These are then imprinted on a paper, which is carefully placed on top. The exhibition also featured a display of traditional costumes from OIC Member States, a fashion show of Turkish kaftans, Sufi customs and contemporary Turkish designs and a jewelry exhibition by Gilan of Istanbul. The festival concluded with an auction on selected masterpieces of calligraphy, where the proceeds would go to children with special needs in Saudi Arabia. “This cultural event of Islamic states is an investment of the ability of cultures to reinforce their ties and revive their respective specificities, as well as to support benevolent and charitable activities, which benefit people with special needs, to reflect the human dimensions of cultural activities,” added the princess. 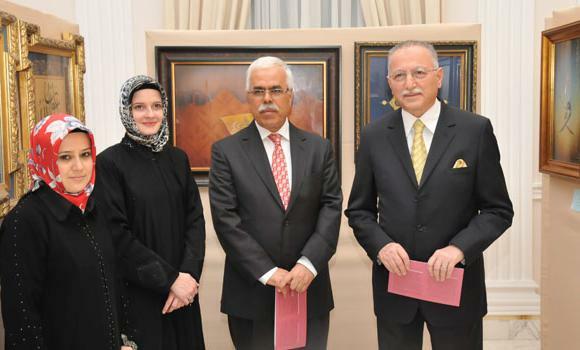 For her part, Ihsanoglu thanked Princess Adela for her support. She also appreciated all those who contributed to making the event a success and highlighted the important role played by women in charitable activities and in promoting culture. 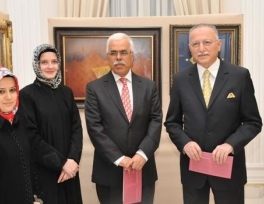 To give the chance to more people to enjoy the exhibition, the Secretary General of the OIC, Ekmeleddin Ihsanoglu, opened this Arabesque and Arabic calligraphy exhibition on Feb. 28 in a special ceremony at his residence. The exhibition was part of the cultural and media activities staged by the OIC to create awareness about the components of the Arab and Islamic civilization. It also included a dinner — a cultural array of traditional dishes from the OIC Member States. Seeing the enthusiasm and admiration of the attendees, Ihsanoglu is considering holding the exhibition again on a wider scale.